Deciding that it is time to get myself some adequate tools finally. So what wrench/socket should I get for the N tractor spark plugs? It's getting kinda annoying sticking a adjustable wrench in there doing a 8th of a turn at a time. And then I suppose I should wait for the tractor shows and yard sales to look for them cheap too, but what do you guys use? 81A-17017 -used from June 1939 thru August 1939. 11/16 6-point box end and 13/16 open end. 01A-17017 -used from August 1939 thru April, 1940. 11/16 12-point box end and 13/16 open end. 01A-17017-B -used from April, 1940 through all of 8N production. 11/16 12 point box end and 13/16 12 point box end. This is the 'suitcase handle' wrench. perfectly for N-Series Tractor spark plug R&R so I keep it in my tractor toolbox now. Not shown is the 2C-17017 stamped steel socket and handle wrench that was issued wit h the new NAA Model with the overhead valve engine. 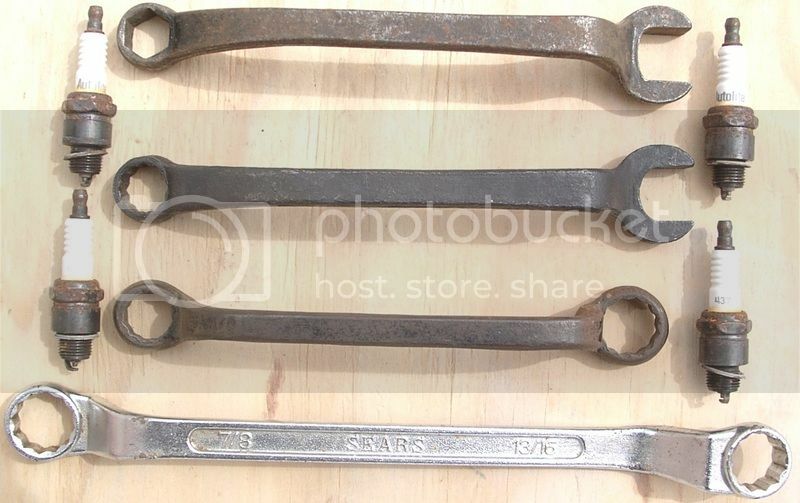 The Ford Tractor spark plug/cylinder head wrench had four versions in its lifetime. 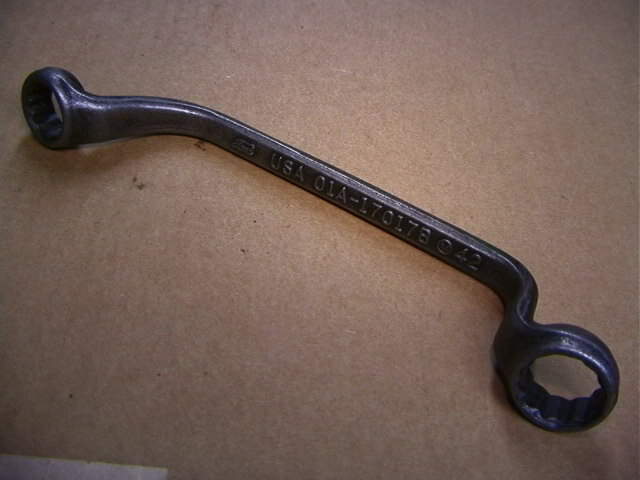 The first wrench issued with the early, early 9N's was the Ford Part Number 81-A 17017 wrench, a 6-point box end and an open end. In August,1939, it was revised to the p/n 01A-17017, a 12-point box and open end. In April, 1940, it was revised to the 'suitcase handle' style as shown, p/n 01A-17017-B, both sizes at 12-point style. This was used up until the NAA(Jubilee) Model when the 134 cu/inch overhead valve engine was introduced. 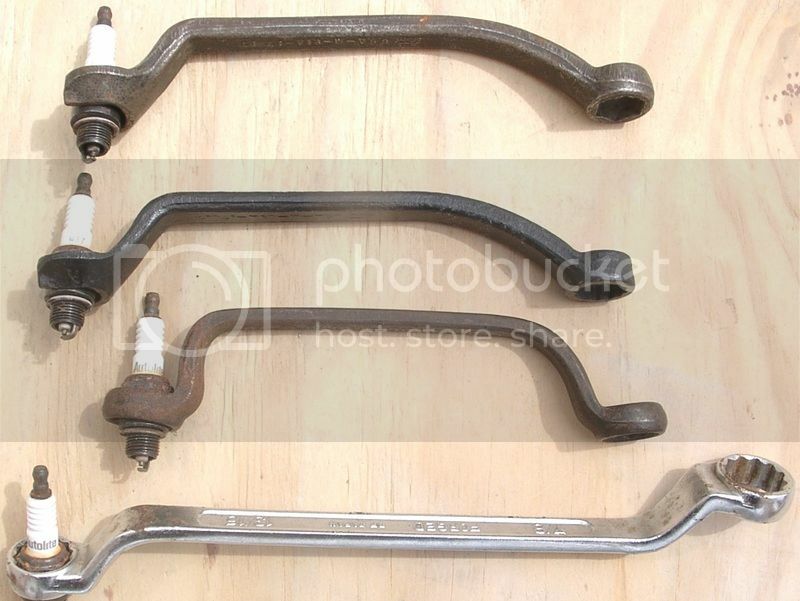 Then Ford released the new socket and handle wrench, p/n 2C-17017 -see LINK. FYI -contact me if interested in an original set of the toolkit - email is open. I use a pair of ViceGrips and a hammer. That is when I am trying to break something. Other then that I use a plain old rachet and socket. I use a 13/16" 3/8 drive deep socket. I use the suite case handle wrench that came with my tractor.